A bribery case gone wrong leads a woman into the deep, dank Carolina Lowcountry on a manhunt. Carolina Slade, a by-the-book federal county manager in the coastal Lowcountry of South Carolina, reports an attempted bribe only to find herself a key player in a sting operation run by Senior Special Agent Wayne Largo from the IG Office in Atlanta. However, the IG isn't telling Slade everything about this case or the disappearance-presumed-murder of Slade's boss the year before. When the sting blows up, both cases are put on hold and Wayne is yanked back to Atlanta, leaving Slade to fear not only for her life and job, but for her children's safety. Suddenly, operating by the book is no longer an option. 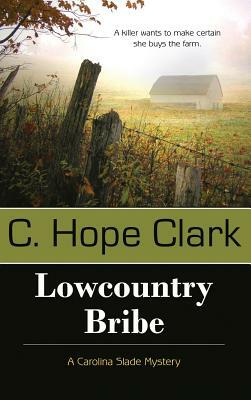 Author C. Hope Clark, an award-winning writer of two mystery series (Carolina Slade and the Edisto Island mysteries), founded FundsforWriters.com, which Writer's Digest has recognized in its annual 101 Best Web Sites for Writers for almost two decades. Hope is married to a 30-year veteran of federal law enforcement, a Senior Special Agent, now a private investigator. They live in South Carolina, on the banks of Lake Murray. Hope is hard at work on the next novel in her Carolina Slade Mystery Series. Visit her at chopeclark.com.